When you park in the office car park, you usually have no problem finding your car again at the end of the day. The next day, you might park a few spots further away. However, in the evening, you find your car, even though the memories of both days are very similar. You find your car (also) because our brains are able to store memories of very similar events as distinct memories in a process called pattern separation. Researchers at the Institute of Science and Technology Austria (IST Austria) are deciphering how the brain computes this pattern separation in a brain region called the dentate gyrus. Results of their work are published today in Nature Communications. In the dentate gyrus, two types of neurons send signals: principal neurons send excitatory signals, while interneurons send inhibitory signals. The researchers sought to decipher the rules of connectivity between them – which neurons send signals to each other, are connections between neurons reciprocal or do many neurons converge to send signals to one main neuron? They recorded signaling between neurons to understand how the neurons are connected and how the local circuit works to support pattern separation. Espinoza performed octuple whole-cell recordings, in which she stimulated one neuron in a slice of the dentate gyrus, and recorded how the other seven neurons respond. By labelling all stimulated neurons, she could then reconstruct the morphology of the circuit. 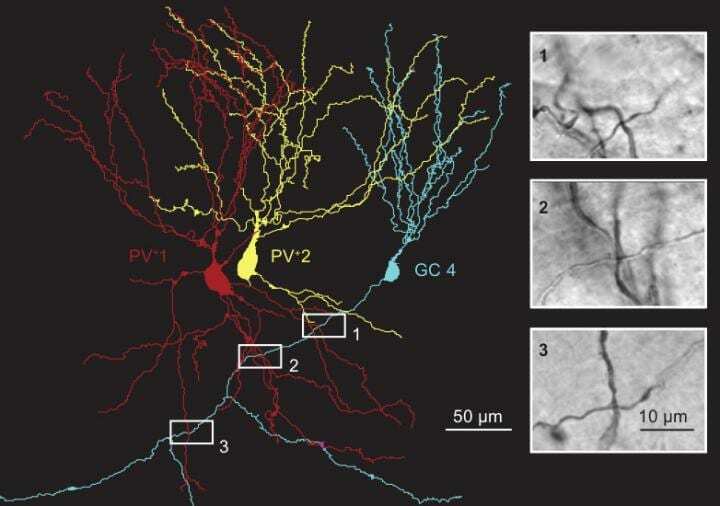 The researchers found that one group of interneurons, the parvalbumin-expressing interneurons, are connected in a specific way only in the dentate gyrus. In the dentate gyrus, parvalbumin-expressing interneurons mainly inhibit the activity of nearby neurons in a process called lateral inhibition. In other brain regions, such as the neocortex, parvalbumin-expressing interneurons are not connected in this manner. "We think that the unique connectivity rules established by parvalbumin-expressing interneurons, such as lateral inhibition, represent a circuit adaptation to specific network functions that occur in this brain region", explains Claudia Espinoza, "Our experimental data supports the idea that pattern separation works through a mechanism called 'winner-takes-it-all', achieved via lateral inhibition in the dentate gyrus. However, this has not been proven yet. We need behavioral data and computational models, which we are working on." After the dentate gyrus separates similar memories to avoid an overlap between them, the CA3 region of the hippocampus then stores these memories. In a previous article published in Science in 2016, Peter Jonas and Jose Guzman showed that the connectivity in the CA3 region of the hippocampus is designed to recall information of stored memories in a process called pattern completion. "At a biological level, our group found the connectivity rules that support the computational function of a brain region", says Espinoza, "Our work contributes to showing how local circuits are optimized for the specific function of a brain area. While the input that reaches the dentate gyrus is important, the way in which the dentate gyrus then computes this information to achieve pattern separation is crucial."